Abraham and Lot separate the land. 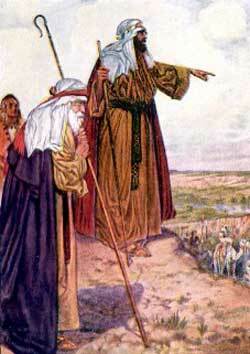 AFTER ABRAM RETURNEDfrom Egypt, he and Lot journeyed to the place where they had first pitched their tents in Canaan. There Abram had built an altar to worship God. At the very same place he now sacrificed another offering, and again talked to God. Abram was now a very rich man. Not only did he possess many servants, flocks, and herds, but he also possessed much silver and gold. And we find that his nephew Lot owned many servants and sheep and cattle too. Wherever these men and their servants pitched their tents, the place looked like a tent-town. And the country all around them would be dotted with cattle and sheep. After some time trouble arose between the servants of Abram and Lot. Some of Abram’s servants were caretakers of his cattle and sheep. They and the servants who cared for Lot’s flocks quarreled. Abram’s servants wanted the best pasture-land for Abram’s flocks, and Lot’s servants wanted that same land for their master’s flocks. And so the trouble grew. By and by news of the quarrel reached the ears of Abram. He looked out over the crowded country and saw how hard it must be for the servants. How could they always find Places near by where tender grasses grew and where water was plentiful’ He saw, too, the villages of the Canaanites not far away, and he knew there was not room enough in that part of the country for all to dwell together peaceably. From the height upon which Abram and Lot stood to view the country they could see far to the east and to the west. Because Abram was the one to whom God had promised all this land he could have chosen the better part, or he could have sent Lot and his servants away out of the land altogether. But Abram was not selfish. He kindly offered Lot the first choice. And Lot, forgetting the kindness of his uncle, thought only of his own interests and chose the east country, through which the Jordan River flowed. After Lot departed with his possessions, God spoke again to Abram. Perhaps God saw that Abram felt lonely. So he comforted him by reminding him of the promise that the whole of Canaan’s land should belong to him and to his children. As yet Abram and Sarai had no children, but God said that some day the children of their grandsons and great-grandsons should be many. And Abram believed God. God also told Abram to journey through the length and breadth of Canaan’s land to see how large a country it was. So Abram moved away from the place where he and Lot had lived together for the last time, and came to a plain called Mamre. Here he pitched his tents under the oak-trees near the city of Hebron, and then built another altar to worship God. This entry was posted in Discipleship and tagged Abraham, Abram, Canaan, Christ Jesus, Christianity, Egypt, God, Hebron, Jesus Christ, Mamre, Sarai, theology. Bookmark the permalink.